Credentials | Canine Training<p>by Mystic Moon, Inc. This is an extremely difficult test. It’s a pass or fail test, not just point deductions. Spotter Publication of Dalmatian Club of America, Inc. Listed here are just a few of my favorite learning experiences; and, most valued Instructors, and Coaches. Ken Ramirez: Has been training a variety of animal species all over the world, for 40 years. This Lecture included discussing the basics of operant conditioning, and the advanced topic, by reviewing the advantage and techniques of using non-food reinforcers. Also, discussion on the strategies for handling animal mistakes in a positive way. Primary reasons for training could be physical exercise, mental stimulation, cooperative behavior (teeth cleaning and brushing, trimming toenails, inspecting inside of the ears), and general animal welfare. Secondary reasons for training an animal could be entertainment, sport, conservation, research and education. Dr. Roger Abrantes, Ethology Institute Cambridge: “We humans have never been able to contemplate a thing without changing it; and yet the most important must be to understand, accept and respect other living beings independently of their species and race.” ~ Roger Abrantes in Evolution". Dr. Abrantes has a PhD in Evolutionary Biology and an Ethology, DHC MAPBC. He has authored 17 books in numerous languages, and numerous articles on behavior. He is probably one of the most versatile ethologists in the world. He is especially known for his views on social behavior, and it's applications to the daily understanding of pet behavior. For his working methods he uses psychology rather than power, teaching the animal new patterns patiently and efficiently step by step. Ivan Balabanov: Competed in the USA National Schutzhund Champion, Vice Champion at the Belgian Shepherd Championships, and he competed on 7 Schutzhund World Teams. Ivan has demonstrated his dog training system at dozens of national seminars and on his videos, including "Obedience Without Conflict". Yes, that is me, with a real live full blooded wolf! His eyes mesmerized me! I felt like a deer looking into headlights, I honestly could not look away. 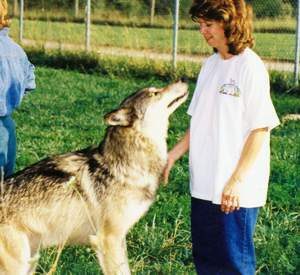 Wolf Park was an amazing opportunity to study the root body language of canines, in a variety of social situations. At Canine Training by Mystic Moon, Inc. we believe in continued education outside the Midwest. Why outside the Midwest? Because "training techniques" differ greatly around the world, and become regional. Most trainers in a region usually have similar techniques, because they have learned from each other; and, see each other's techniques at local events. Dr. Erich Klinghammer: Director of Wolf Park, Institute of Ethology, which is dedicated to the conservation, research, and education in the Biology of Behavior and Ecology of Animal. My stay at Wolf Park was a wonderful experience -- co-habiting with a pack of wolves, therefore learning by sight, sound and touch (at a very accelerated rate!). Chuck Tompkins: Vice President Curator for the largest marine park in the world. He has trained over 100 different species. Association of Pet Dog Trainers: Conducts dozens of Conferences, Seminars, and Workshops annually. APDT is a professional organization of individual dog trainers who are committed to being better trainers through education.